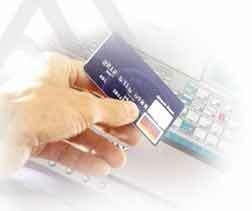 Online Credit Card Payment Gateways . EuroConsulta International . e-Payment, Online Merchant Accounts, Payment Gateway . Through our trusted payments partners, our E-commerce team is able to provide you with a secure, multi currency, online payment gateway for the processing of Credit Card payments over the internet. Any website can easily be connected to the Payment Gateway and Shipping Card module in a matter of minutes, without any requirements on the Client's side. Merchants can review transactions and reverse payments via a user-friendly Merchant Interface. Powerful search and report functionality provides an online auditing module for the Payment Gateway. The secure payment forms may be hosted on the provider's web servers saving merchants the cost of having their own security certificate. Where complicated coupling with back-end business systems is required, the Payment Gateway can be customised to fit any business model. The Payment Gateway offers a complete security solution. Data is encrypted both during transactions and during storage, using 128 bit data encryption. Card details are only divulged to the Bank. Merchants using the payment gateway need not be burdened with the responsibility of handling confidential data. You can choose from a number of payment plans to suit your business model. High volume discounts are available. Contact us for more information about our e-Commerce solutions.